Sean Berrios, an amateur poker player and an air force man has won his first ever major live tournament by winning the main event of WSOP Planet Hollywood. This winning yielded him a very good cash prize of $347,192 and a WSOP Gold Ring. The Event planet Hollywood Circuit is one of the top poker tournament festival organized by WSOP. This particular tournament is one of the glamorous tournaments hosted by World Series of poker in Las Vegas attracts many celebs and former champions. The tournament also attracted top rated players and November niners and former WSOP Gold Bracelet winners. Berrios said after winning this first ever big live tournament that “I’m ecstatic right now “. This is a big moment in my life. I stayed patient and was looking to pick my spots without doing anything wrong. On Day 1 A of the tournament started on Friday, there was total 551 entries but the event attracted 753 more entries to the next day of gaming that is on Day 1B. It means a total of 1,304 entries subscribed for the main event. The buy in of the No Limit Hold’em Main event was $1,675, attracted a cash pool prize of $1,956,000. The prize distributed to the top 135 players/entrants. 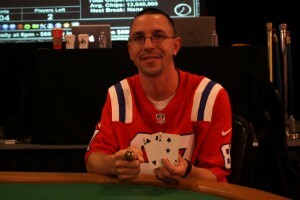 1st:– Sean Berrios of St. Croix, Virgin Islands (USA) won the first prize of WSOP Gold ring and a cash of $347,192. Sean Berrios best live earning playing poker is $347,192 and total earning till date for him is $460,828. 2nd:– Peter Hengsakul of Los Angeles, USA got second position and took home $215,160. Best Live cash for him is $325,780 and total earning till date for Peter is $1,028,368. 3rd:– A Greek player Mr. Antonios Roungeris got third prize of $157,908. Best Live Cash for him is $157,908 and total Live Earnings $228,832. 4 th- Davis Aalvik of Gardena USA, wins $119,316. Total earning for him till date is $399,558. 5 th- A US pro and Gainsville native Ben Palmer took home $91,052 as winning amount. Best Live Cash for Ben is $189,975 whereas total Live Earnings for him is $1,383,603. 6 th- Brian Hansen (A pro from Las Vegas) selected for 6th position and took home $70,083. Best live cash for Brian is $70,083 and total is $133,523. 7th – Dennis Stevermer of St. Paul, MN(USA) booked for 7th place and got his share of winning total as $54,752. 8 th- Another pro from Brigantine, NJ, Jonathan Chehanske was at 8th place and got $42,993. Best live cash for Jonathan is $107,862 and total cash till date including this victory is $317,247. 9th – Ali Fazeli of Houston, TX wins $34,269 and booked for 9th place.